STORMAJOR 380 Series - for materials with a bulk density ≤1 t/m3, such as cereals, fertiliser or alternative fuels. STORMAJOR 450 Series - for materials with bulk densities from 0.9 to 1.6t/m3, such as additives, light minerals or fertiliser. STORMAJOR 800 Series - for materials with bulk densities from 1.5 to 2.1 t/m3, such as heavier minerals or ores, sand and gravel. In developing the machine, the engineers considered its suitability for dealing with the wide range of requirements in ports and terminals, as well as making it reliable and easy to maintain. The boom is attached below its centre of rotation, so that fines do not collect in the bottom of the machine. The feed section of the main chute is completely decoupled from the conveying sections, which means that, if necessary, bulk materials with particularly poor flow properties can be actively shaken to make the process more efficient. The standard angle of the transfer chute walls is already an effective measure to reduce the danger of bridging when handling different materials which do not flow well. Each version of the STORMAJOR has two travel and power options. A wheel-mounted STORMAJOR will be towed, or a tracked machine will have its own drive. When moving the machine fully loaded, it can be equipped with additional outrigger support. The new STORMAJOR is offered with a choice of engine and drives. For example, the conveying sections can be either electrically or hydraulically driven. The self-driven versions can be equipped with diesel generator sets with various emission standards, up to TIR5. The main drive concept depends on off-site power supply or pumps and generators driven by the diesel gensets. The “Power twin” sets new standards here with an additional distribution gear directly flanged on to the diesel generator set, the company claimed. With a large range of extras, each STORMAJOR can be further tailored to the specific requirements of the application. 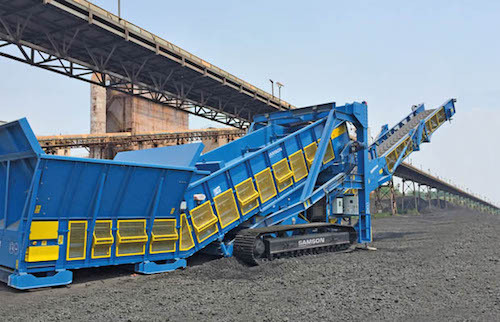 Examples of these extra features include additional transfer chute systems, various lining options for chutes and conveyor, dedusting solutions, additional enclosures for the conveying sections, operation and maintenance platforms, operator cabins and lighting packages.